Wrist fractures may be caused due to a fall on an outstretched arm, vehicular accidents or workplace injuries. Certain sports such as football, snowboarding, or soccer may also be a cause of wrist fractures. 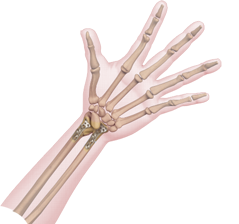 Wrist fractures are more common in people with osteoporosis, a condition marked by brittleness of the bones. Your doctor performs a preliminary physical examination followed by imaging tests such as an X-ray of the wrist to diagnose a fracture and check alignment of the bones. Sometimes a CT scan may be ordered to gather more details of the fracture, such as soft tissue, nerves or blood vessel injury. MRI may be performed to identify tiny fractures and ligament injuries.